I met officer Jason Moszer as I was passing through Fargo. I too am a police veteran and a military veteran. He was checking out something at that Motel 6, right off the freeway, and I was just checking out. We talked in the parking lot. I could tell he was a good cop and proud to be one. He had a swagger and a positive attitude. He was in plain clothes and driving an unmarked sports car. I introduced myself and asked about crime in Fargo. He said it wasn't bad, but it was getting worse as the city grew. 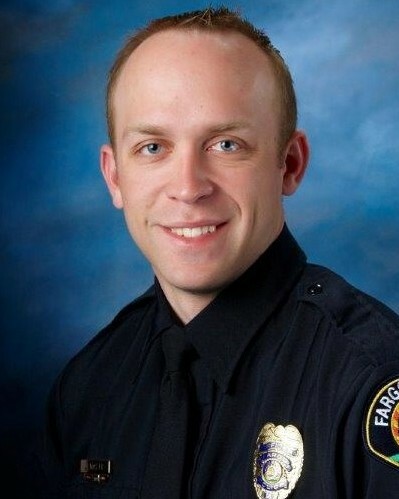 Next I heard of Jason I was scrolling through the front page national news and their was his picture "Officer Down". I talked to my students that day about having met him and that he was a hero. I was teaching right near Minneapolis at the time, one of the epicenters of the BLM, "fry'em like bacon" marches and it had been wrongly effecting my students minds. I think Jason's heroism helped them see the real picture that day. God Bless him and his family! I had the honor of wearing your Band of Honor, as I traveled from Egg Harbor Township, NJ to Washington, D.C. to honor our fallen brothers and sisters and to remember the survivors. I am the President of the NJ Division of Law Enforcement United and we ride bicycles each May 10th through May 12th to support our "Blue Family." God Speed and God Bless!!! I ran a hero's 5k in your Honor today Sir. YOU are not forgotten! My thoughts and prayers to your family and friends. Another Hero taken too soon. To the Moszer family, fellow officers, and all who call Jason beloved, my heart goes out to all of you and may you find comfort in your loved ones and your strength in your faith. When my son was killed, the entire law enforcement community in our area embraced us in a circle of love and support, and I know you will receive the same support. It makes the unbearable less torturous, and I pray for your solace. This reflection is sent with the utmost respect for the dedicated service Officer Moszer gave to his community and the citizens of North Dakota, and for the supreme sacrifice he and his family made on February 11, 2016. On behalf of the Lake Region State College Peace Officer Training Program Class # 80 (Minot, North Dakota), we thank you for your service to this great country and to the citizens of North Dakota. May you rest in peace and your family find peace in your absence. As we follow in your footsteps in training in the Lake Regions State College Peace Officer Training Program, we hope that we make you proud as we graduate and serve in the law enforcement community as you have before us. My family and I would like to extend our sincere condolences to the family, friends, and fellow co-workers of Police Officer Jason Moszer during this very difficult time. You remain in our thoughts and prayers. May you find comfort and support from those around you. May God help heal your aching hearts. Rest in peace, Police Officer Jason Moszer . Dear Lord watch over Our Families that wear a Badge. My Family sends tearful Condolences to Jason's Family, Friends, Department, Community, & Country. Thank you Jason for your Brave & Unselfish Service. RIP Jason , Son of Valor, with Honor. My thoughts and Prayers are with your family, community and fellow LE officers. Senseless and needless death. How do we express our deepest regret for your loss of husband and father? We can only use what limited words we have to express our feelings of loss and sorrow for you tragic loss. May God be with you and your family. R.I.P Officer Moszer. May you protect the innocent in heaven as you have done while on Earth.